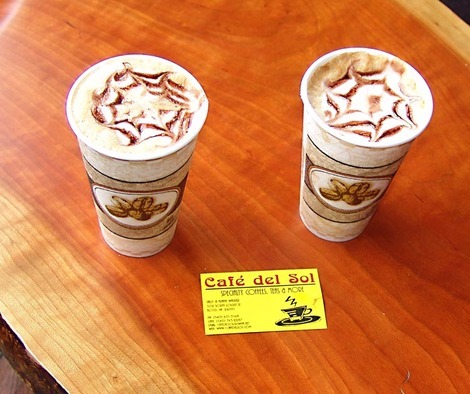 The Baristas at the Cafe del Sol in Floyd, VA, are constantly seeking to improve themselves. They are not content with producing excellent espresso-based drinks, they insist on making them attractive as well. I am in favor of experimentation especially when it comes out like this. I will definitely order this again. Many thanks to Sally and Frank Walker, owners of the Cafe del Sol, for encouraging their staff to produce a superior level of service. Disclaimer: I have no financial interest in the Cafe or in any of the establishments in Floyd that I write about. My sole purpose in recommending them is to enable others to take advantage of the unique services that these establishments provide. Oh, that looks good! I had an excellent pasta salad there the day of the blogger’s meeting, and excellent toffee cookies!